Raynaud syndrome is when your fingers and toes (and occasionally other parts of the body) change colour and become painful when you get cold. This is due to blood vessels narrowing so less blood goes to your fingers and toes. This change in colour can last minutes or hours, but the colour will gradually return to normal when you warm up. This condition is quite common and although uncomfortable, it doesn't usually cause any long term problems. For most people, there's no known cause. Sometimes, there are secondary causes for it happening. For example, it could be caused by a tissue condition such as systemic lupus erythematosus (SLE), medications such as beta blockers, or some migraine medications. This is called secondary Raynaud syndrome. There are no specific tests for Raynaud syndrome, but your GP might suggest a blood test if there might be a connective tissue condition that's causing it. The best thing you can do is keep warm in cold weather, by wearing gloves, warm socks, and avoiding very cold weather. For most people, keeping warm is enough to manage Raynaud syndrome. For others, medications can help increase circulation to the fingers and toes. Stopping smoking is helpful as smoking makes your blood vessels constrict more, which can make Raynaud syndrome worse. See your GP if you think a medication or another condition could be causing Raynaud syndrome. General information about diagnosis and treatment. What causes it, how it's treated, and how you can help to ease the symptoms. Written by HealthInfo clinical advisers. Page created March 2018. Last updated July 2018. 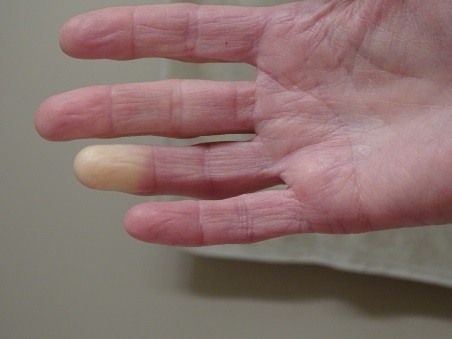 DermNet NZ – Raynaud phenomenon, retrieved March 2018.